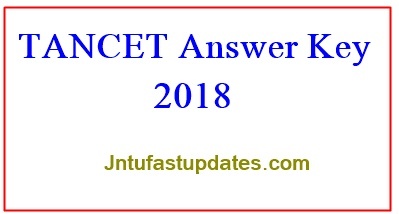 TANCET 2018 Answer Key Solutions : Anna University has organized the Tamil Nadu Common Entrance Test (TANCET) examination on 19th & 20th May. This examination has conducted in many examination centres across the state. Many of the competitors have clashed for the examination this year. All the competitors can download TANCET Answer Key to analyse the answers. By comparing the answers with official answer key, aspirants can check the probable score in the examination. Answer key/question paper solutions are the most useful document to estimate the score. It will be accessible in PDF format. Aspirants can download TANCET Question paper solutions and compare with the corresponding set to estimate the score. Candidates can download TANCET answer sheet from the conducting university’s official website, annauniv.edu. Annually the Tamil Nadu Common Entrance Test (TANCET) is conducted by Anna University to offer admission for various Post-graduate degree courses such as MCA, MBA, M.E, M.Tech, M.Arch & M.Plan courses. The Anna University is the organizer of TANCET/Tamil Nadu CET Examination. Lakhs of aspirants seeking admission in various post graduate degree courses in PG Colleges of Tamil Nadu are going to appear for this test. The admission will be given on the basis of student’s merit in this examination. Candidates those have just completed their Graduate degree in the corresponding stream are eligible to appear for the Tamil Nadu CET examination. Every year a large number of competitors seeking admission in PG Courses in Tamil Nadu are going to clash for this examination. Aspirants competed for the Tamil Nadu Common Entrance Test can download TANCET Answer sheet in the 3rd week of May (expected). Candidates can download TANCET answer key for set A, Set B, Set C, Set D and compare with the corresponding set to estimate the score. Compare with the corresponding answers are given in the answer key will let the competitors analyse the attempt. Get the answer key from Anna University official portal and calculate the score. Visit AU official portal, annauniv.edu on regular basis to analyse the score. The TANCET result will be announced within 3 to 4 weeks after the examination. Tentatively, the TANCET result is expected to release in the 3rd week of June. At that time of results, the cutoff marks will also be announced by the Anna University. Candidates scoring the minimum cutoff marks in the exam can get the admission in various colleges of Tamil Nadu. The Cutoff marks will be released based on various factors such as the level of competition, number of seats available and other factors. annauniv.edu is the official portal of Anna University. Have a look at the page. Karnataka TANCET Answer key 2018 Link appears in this section. Click on the link. TANCET Answer Key for all sets appears on Screen. 2018 question paper and answer key please! !